In turn, parents and the public have been led to believe that a standardized test-based accountability plan is a school reform effort. The education of millions of children has suffered as a result. Nothing to date has stopped the spread of this fallacy. Refusing to let your child be part of Smarter Balance Assessment Consortium (SBAC / ISAT 2) testing will help end this nonsense! Grades tied to SBAC high-stakes standardized tests. None of these applications are fair or justified. Just because standardized tests are relatively easy to administer and cheap to grade, doesn’t make them the right choice. For decades many parents, administrators, teachers, and concerned citizens have tried to reason with authorities concerning the misuses and abuses of high-stakes standardized test scores (scores tied to rankings, punishments, or rewards), but nothing has worked to stop the unethical testing. Opting out or refusing testing of your child is a boycott, a demonstration that unfortunately has become a last resort in drawing attention to this incessant and senseless testing. When testing practices have not followed compliance with the Code of Fair Testing Practices, http://www.apa.org/science/programs/testing/fair-testing.pdf they are unethical. Parents don’t need to explain this to the public education system, the system – particularly lawmakers – owe them an explanation. Idaho is a local control state. “Because ISAT testing is used as a graduation requirement and as a measure of a student’s progress, we desire that all students take the ISAT. However, if a parent chooses to not allow their student to test, they need to contact their district/school and ask for the proper protocol, because each district handles it differently. Typically, a letter is requested from the parent explaining that they are refusing to allow their child to test. Idaho is vague as to the consequences for not completing all “required” tests because we are a “local control state.” Alternate routes to graduation have been in place for districts to decide that issue since high-stakes standardized testing became a requirement. It is the 10th grade SBAC/ISAT 2 test that counts for graduation. And our state has also added ACT, SAT, or Compass for 11th grade further making the additional SBAC/ISAT 2 requirement seem like overkill. Alternatives that parents can request from their school board include multiple forms of assessments such as a portfolio review including classroom evaluations of student learning objectives (teacher-created formative and summative assessments). To assist in the fight against high-stakes standardized testing, this Questionnaire on Testing (provided by John Merrow of Learning Matters) should be provided to your superintendent and school board members as a tool for them to review their testing practices. 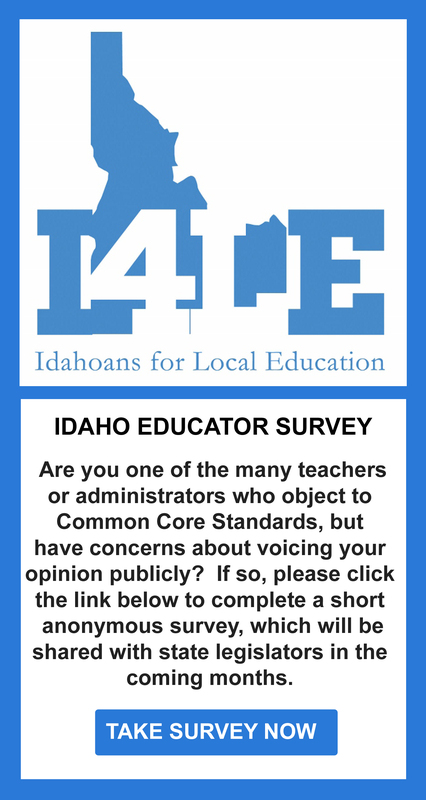 If you still are unclear as to what to do, please consider reading Why Refuse the Use of Standardized Testing this Year in Idaho? The biggest shame is that lawmakers put parents and students in this position. Shame on them for being ignorant! and the guide they put together for Idaho! Thank you to Vicky Young for putting this together.